Our friendly and welcoming company is always looking for new members. If you love opera and your heart is in Hastings there are many ways in which you can be involved both on and off stage no matter what your age or talents. We’re very keen for new members of all ages. It is not important to have a trained voice – if you think you can sing and are happy to take direction then please get in touch. We like to develop our chorus members and encourage them to audition for minor principal roles when they feel they are ready. Feel free to make contact and join one of our mailing lists. Are you a professional singer, want to join as a chorus member or as a supporting role? Opera isn’t just about the singing and often requires non-singing performers. As an actor, dancer or general extra there are usually opportunities to perform with us in our staged productions. As opera is a complicated and demanding art form we are always in need of additional support behind the scenes. If you’re interested in set-building, design, wardrobe, procuring props, marketing and advertising or fund-raising, or even just making the tea, we’re sure we could use your help. As a new member you are welcomed as a guest of Opera South East for your first six months. If you take part in a staged production within that time you will be asked to pay a one off performance fee of £20 and a refundable costume deposit. After that we ask an annual membership fee of £75 p.a. (under-18s are free). Fees are paid on 1st October or, if paying in two instalments, 1st October and 1st April. Buy Now does a one-off annual subscription. Subscribe does an annual renewal going forward. 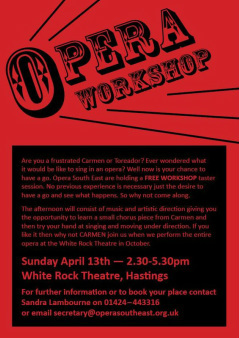 OSE offered a free afternoon of opera tasters in April 2014 in a workshop that focussed on different areas of Carmen and pieced the strands together over the day. By all accounts it was much enjoyed. We are considering running another workshop early in 2015.